How thermosyphon solar water heater works, advantages and what to consider when building one. Ideas with designs how to make your own passive solar heating system. Thermosyphon systems are designed to use a natural way (convection and gravity) to circulate the inside fluid to a storage tank and transfer the heat. The thermosyphon solar water heater consists of one or more solar collectors filled with the heat transfer fluid or water, and the storage tank. As we are talking about passive solar water heating systems, the pump and controllers are not needed. And this is one of the greatest advantages, the thermosyphon solar water heater is cheaper than the active system, which saves you money. Greater the temperature difference between the heating fluid in the panels on one side and water in the tank on the other, faster the water flow is. When the solar collector cools below the temperature of water in the tank, the water flow stops. As said before, the thermosyphon solar water heater consists of the solar collector and the storage tank which is installed above the panels, either right above it (integrated system) or somewhere inside the home, such as the attic. In order to make the thermosyphon system working, the storage tank should be at least one foot or 30 cm above the solar panels, which will allow hot water rise to the top of the collector and move further into the tank (natural convection). Solar heat and gravity are what is needed for this process to work properly. A flat plate panel is the most used collector type of the passive solar water heating systems, while some systems can use concentrating collectors to produce water with the higher temperatures, or evacuated tube collectors, known as vacuum tubes, efficient even during the cloudy days. If water is used as the heating fluid, we are talking about the open circuit systems that are recommended for areas that are frost-free. Otherwise, the lower, freezing temperatures might freeze the water inside the pipes and cause them to burst. This is especially dangerous if the collector is not in use when all the heating fluid remains in the collectors. If the heating fluid is the antifreeze solution, we are talking about the closed circuit thermosyphon solar water heater, and they can be used in the areas that are prone to frost and have hard water issues. In both cases, the collector should be full of the heating fluid to prevent the air pockets and if the sediment buildup is a problem it is recommended to use a water softener. One of the major disadvantages of the thermosyphon systems is how to prevent the heat loss caused by the reverse water circulation, especially during the night when the water temperature is low. Other ones are the danger of freezing and weight of the system (the roof might need some reinforcement). The solar panel has a box shape, usually made of the plywood, aluminum or stainless steel and has a cover made of the plastic or glass. The drain valve is a must so you can drain all the water before the winter, and that allows easier maintenance and service if needed. The recommended piping will include types such as PEX, polyethylene, which can protect water from freezing, but the most used is copper, with the solid and flexible sections. Another solution for the freeze protection system is to use the dump valves or heaters in the bottom collector. The storage tank is usually very well insulated so the heat loss is reduced significantly. Water from the storage tank can be used directly as the potable water for a shower, or indirectly, so it preheats water inside the gas or electric water heater. The most popular tank sizes are 40, 50 and 80 gallons. Piping of the cold inlet water connects the bottom of the solar panel and storage tank, while the pipe with the hot water runs from the top of the collector to the top of the tank. You can also purchase a solar water heater kit, which is more expensive than making your own, but the advantage is that it takes less time for the installation. Look for the high-quality materials, such as the stainless steel construction and thick foam insulation for the reduced heat loss. When planning to build your own thermosyphon solar water heater, the solar panel might consist of the wooden box, made of the plywood, copper pipes and aluminum sheet underneath, everything painted in black for the increase absorbance and the glazing on the top. The solar panel is tilted to an adequate angle so it can have the best exposure to the sun and with the plumbing slope upward to have the thermosyphon flow established. The storage tank is with the 50-gallon capacity and the system uses the electric water heater as the backup. More about this design here. Keep in mind that the size of the solar panels is very important. If it is too small, it won't be able to heat all the water in the tank to the desired temperature, if it is too big it will heat the water too fast and with a higher temperature. 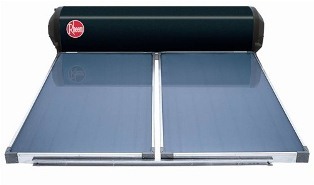 By selecting the right size, the thermosyphon solar water heater will produce enough hot water over the night. For the DIY home project, basic carpentry, plumbing, and necessary tools are required.